In Molière's play The School for Wives [French: L'école des femmes] Arnolphe, "a rich man, aged about fifty", is finally set to marry very sweet and innocent 17-year-old Agnès. Arnolphe began the marriage preparations when Agnès was 6-years-old. He believed that "A man who wants a perfect wife, must make her for himself." Arnolphe had a very traditional and religious view of a wife's role. For example, he opined that a wife should never say, do or think anything that would go against her husband's wishes. 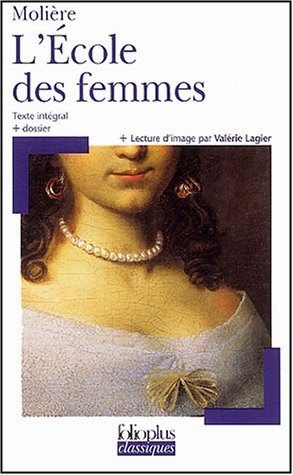 And Agnès read from Some Rules for Wives "A wife must dress only for her husband". Arnolphe successfully excluded Agnès from any immoral influences and shielded "... her from the world"; however, hours before the ceremony Agnès became infatuated with Horace, a young suitor. Arnolphe did everything within his power to not lose the "very pretty" and "very demure" Agnès to Horace. The School for Wives [French: L'école des femmes] is a great example of how money cannot buy a nymphet. There is a major misconception among the masses that young women marry older men for their money. Yet, despite the fact that Arnolphe educated Agnès and fed, clothed and gave her a house with two servants, she still preferred to marry the much younger Horace. Even a conniving gold-digger gets tired of the money. I wrote in The Allure of Nymphets about how Francis “Peaches” Browning eventually left Edward “Daddy” Browning, her fifty-two-year-old husband, despite being lavished with riches. However, in every situation I've researched and observed, the sincere nymphet who leaves her ephebophile for a younger man, regrets it and looks to return to her much older man. Molière's play is similar to the story below.